cheraw freight dock, originally uploaded by Gene Bowker. Here is a side view of the Cheraw Depot.. The loading dock area is in pretty bad shape as the bumper board has fallen. I've learned since I took the photograph that the depot served as both a freight and passenger depot for the Seaboard in Cheraw. Example of a SCL Passenger schedule from the late 1960's before Amtrak took over service. Snow and Ice are not common in South Carolina, so when they do happen it can make for some interesting photographs. 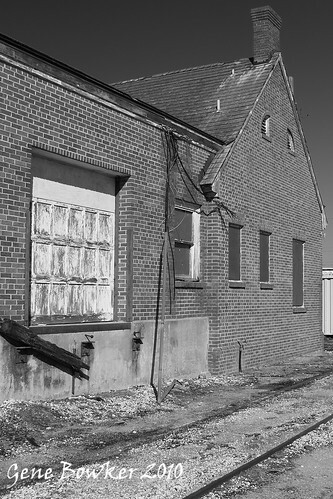 The subject is the Ex-Seaboard Air Line Freight Depot in Cheraw, South Carolina. I was impressed by the architectural styling of the abandoned depot and also loved the light play on the ice and snow on the building. The building is in disrepair and I have not heard of any plans to restore or save it. The Passenger depot is used downtown as part of the police/city hall building. The freight depot is left to rot along the tracks. Wade Hampton: Confederate General and South Carolina Governor has always been controversial. More for his post-Civil War politics than his service in the Confederacy, Hampton is someone that most people either love or hate. His statue sits on the lawn of the capital building in Columbia, SC. Want to learn more about Hampton? 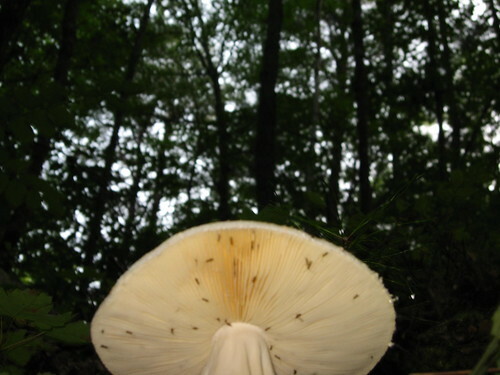 Mushroom.. Ft. Mtn Georgia, originally uploaded by Gene Bowker. NS3277 Warrenville, originally uploaded by Gene Bowker. 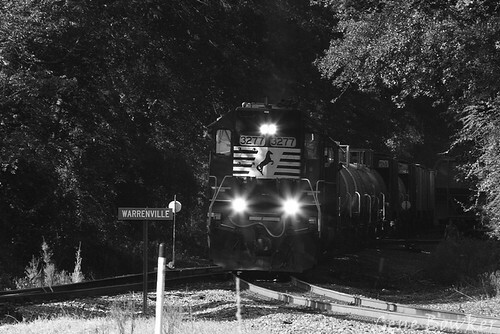 A fall chase last year resulted in this photo at Warrenville, SC where the Ex-Southern route to Columbia continues to the North, while the Ex-Southern now branchline heads East. This NS branchline was the original SC Railroad between Charleston and Hamburg, SC at the time the longest railroad in the world. Now the line ends just east of Aiken and is abandoned from there to Branchville, SC where the line between Charleston and Columbia, SC is met. NW 1962 Calendar Princeton, originally uploaded by Gene Bowker. Luckily through photos and museums there are still memories to remind us how things used to be. 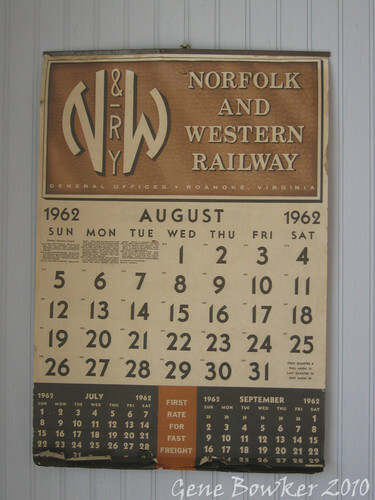 This calendar is at the Princeton, WV museum housed in their great reproduction depot on the side of the Ex-Virginian Railway mainline. The palm tree in front of the office looks pretty cold today. South Carolina experienced a "rare" snow/ice event on Jan 10th, 2011 which caused much chaos in the little prepared area. I love a good fence. While locations such as the Blue Ridge Parkway are famous for their hand-built fences , this fence lives caught my attention at River's Bridge State Park in South Carolina. River's Bridge is the only SC State Park to protect a Civil War Battlefield. The 4 year celebration of the 150th Anniversary of the American Civil War is starting. South Carolina will play a big part in 2011 with a number of events planned around the start of the war with the bombing of Fort Sumpter in April. The Civil War of course still causes debate. What was the cause? What were they fighting for? Who has the "right" to claim the symbols of the conflict 150 years later. No matter what your opinions.. it is a chance to remember history which took place close to home. The steam-era concrete coaling tower in Bluefield, West Viriginia is a reminder of the past which is luckily too big to be easily destroyed. The railroads have been notorious for leveling structures along their right-of-ways when they become obsolete. This is partially done for taxation purposes (there is less assessed value), protection (unused builidings tend to burn or become used by vagrants), or for other reasons. However, the large concrete coaling towers remain along the Pocahontas Division of the Norfolk Southern (EX-N&W ) in West Viriginia. They are so substantial that it would require a lot of money to knock them down, plus they are almost indestructible. Luckily this gives them a reprieve. I'd love to be sharing one of my photos from Florida or my trip to the snow in the NC Mountains with you here.. but there is one problem. My laptop crashed this last weekend. My normal work process has been to download the RAW files from my CF card onto the laptop, go through them to delete out and edit the shots, then move the remaining photos over to the External Drive . All was fine until the laptop crashed (thanks to a Windows Vista SP update I think) in that time after reformatting the CF card and moving the files to my external drive. I'm "hoping" that since it appears to be a software issue, I might be able to dismount the hard drive and pull the files off of it... Note the word hope. Immediately save the files onto the External Drive (then edit from there).